Steven (Chicagoland, United States) on 30 November 2012 in Architecture and Portfolio. As the first building completed on the hilltop, this cottage was the Hearst family’s earliest residence in the summer of 1922. Though usually referred to by the simple “House B,” its formal name was Casa del Monte (House of the Mountains). This justly honors the wide vistas of the Santa Lucia Coast Mountains seen from its north-facing windows. 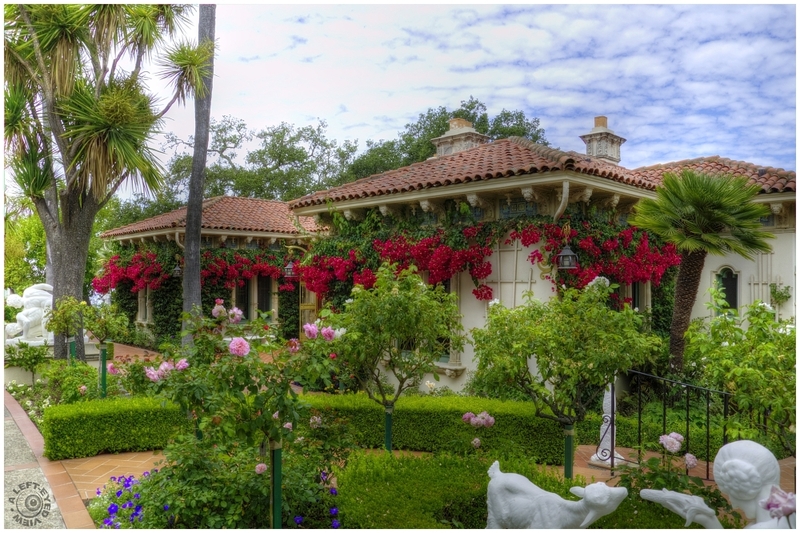 In later years, this stately cottage was used by many of Mr. Hearst’s guests. It contains the so-called “Cardinal Richelieu bed” of ornately carved walnut—and many guests requested the privilege of sleeping in it. The colours really "pop", especially the reds. Such a beautiful cottage. The flowers , shrubs and trees makes it such a beautiful place to be. A beautiful capture with a marvelous combination of wonderful colours. In a secret world of its own - beautiful cottage and lovely shot. I could handle living in a cottage like this one... beautiful shot and processing ! Dort könnte man gut Wohnen. Ein schönes Foto. A very beautiful photo ! Excellent composition...very natural tones and colors! The foliage on the grounds and the house ~ especially the red blooms trimming the house are out of this world; beautiful place ~ Beautiful capture! What a beautiful setting for this 'cottage' ... the plantings are so lush! trés bien fleurie cette maison ! Those flowers are just beautiful! What a charming place. Lovely image! A gorgeous image. Such a beautiful house. That is a charming cottage... although a cottage in my mind would be much smaller than this! :)) I love the photo, it reminds me of something out of a fairytale.... beautiful color and detail..... the greenery and flowers are spectacular! A beautifully maintained cottage. Great contrast and colors captured as usual!